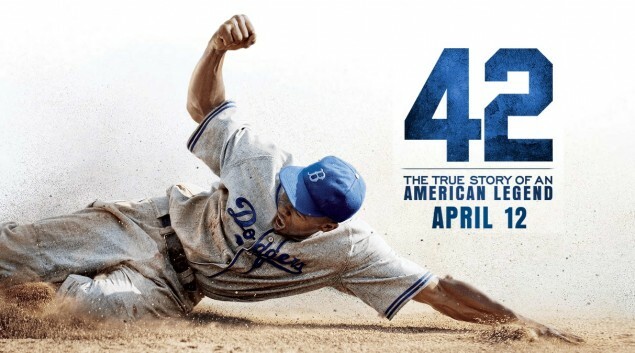 This weekend sees the release of 42, which tells the true story of civil rights hero Jackie Robinson, the first African-American player to break into major league baseball. Does the film do justice to an American icon? Does costar Harrison Ford make us love him again? Read on! 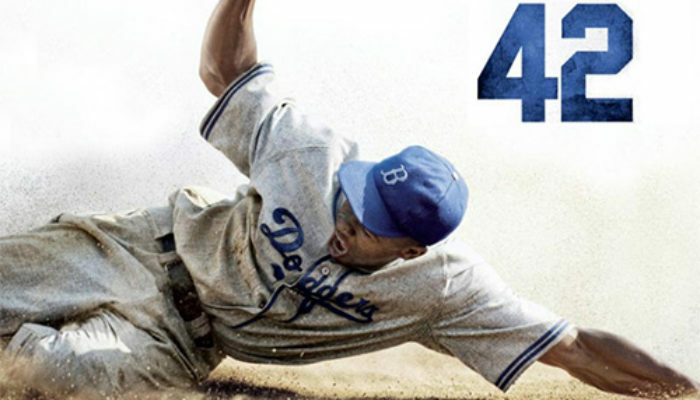 Some critics have complained about 42 because Jackie Robinson was such a virtuous figure that they find him to be a “bland” protagonist, or because the film strongly emphasizes the Christianity of Dodgers executive Branch Rickey, but these refreshing traits are among the reasons I strongly recommend the film. It helps, of course, that 42 is also a sincere and well-acted drama, one so inspiring that it easily bounces back from some first inning flaws. 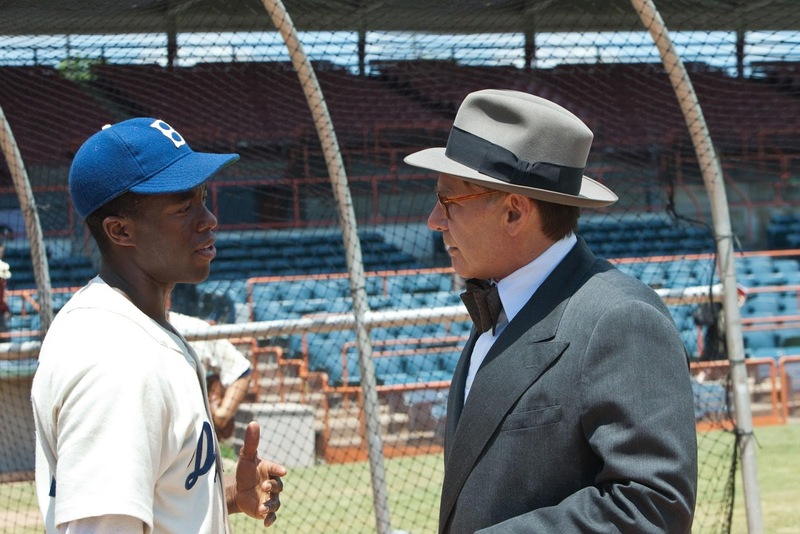 doesn't inject much personality into the part initially, while Harrison Ford's idiosyncratic performance as Rickey seems to be more humorous caricature than fully-rounded character. The tone is also a bit too reverent at first, leaning towards hero-worship at the expense of making Robinson a relatable person. The film soon finds its legs, however, as do the performances. 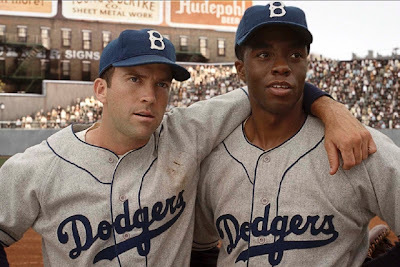 Boseman displays great range as well as masterful use of subtle restraint; Robinson the public figure remains mostly stoic and composed, but one can see a myriad of emotions in his eyes and he gets some powerfully emotional scenes. Ford gives his best performance in decades, displaying conviction, wit, and fire that, frankly, I didn't know he still had in him. He gets most of the funny lines and delivers them with relish. The role bodes well for his return to Han Solo, even if it couldn't be more different. All the other actors are solid, from Nicole Beharie as Jackie's wife to Alan Tudyk (Serenity) in the thankless role of a viciously racist manager. There are times, admittedly, when dialogue leans a little too far towards schmaltz, steering the film away from its sense of realism. Still, there is a natural power in this tale which is captured through genuine, straightforward storytelling. 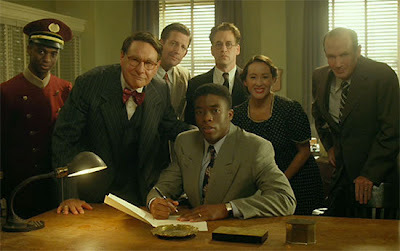 The attention to period detail in clothing, sets, and props is excellent. The aforementioned criticism that Robinson was too virtuous and therefore not interesting holds no weight; he is shown here wrestling with doubt and pain, making his courage all the more inspiring. His marriage is portrayed in a very positive light. Plus, there is a bevy of supporting characters, each at a different place in dealing with their own racial prejudices, whose personal journeys add plenty of dramatic heft. 42 is an important film and, thankfully, it's also a moving and entertaining one. another player spikes him in the calf with his cleats. Several male torsos are seen in the showers, but nothing more is shown. A woman asks another when her last “monthly” was (referring to her period and possible pregnancy). A team's coach is shown in bed with a married woman; he's shirtless and she's in a nightgown (not too revealing). 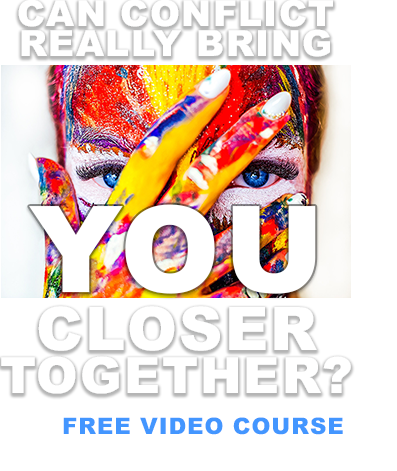 She purrs some flirtatious but not overly-crass comments while he talks on the phone with his boss, who reminds him that the Bible condemns adultery (their affair later has consequences). There are some mild and moderate profanities (several SOB's and g-d's). 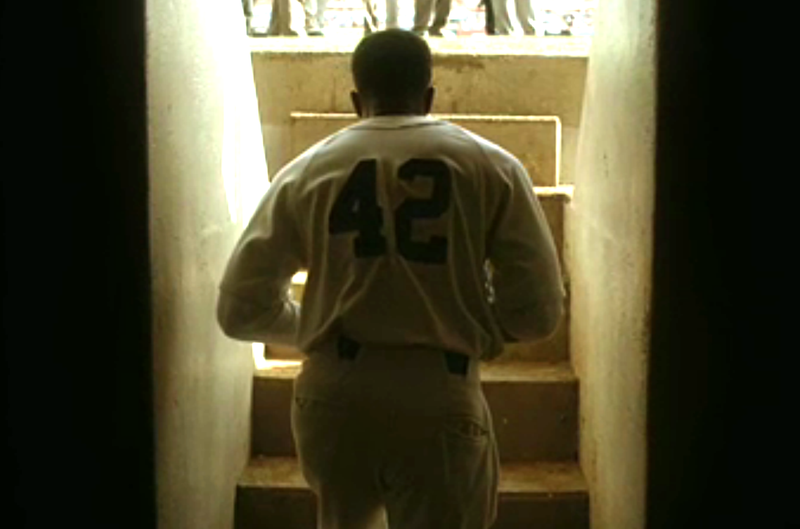 The “n-word” is used numerous times in a historical context, including a painful scene in which an opposing manager taunts Robinson mercilessly. 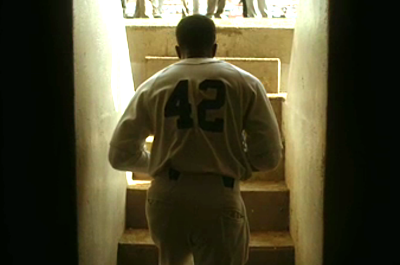 MESSAGES TO DISCUSS: By refusing to fight back, Jackie Robinson followed the courageous example of the Savior Jesus Christ (Matthew 5:38-40, 43-44; Isaiah 50:6). Husbands and wives are to love and be faithful to each other (Doctrine and Covenants 42:22). “Black and white…male or female… all are alike unto God” (2 Nephi 26:33). “No man who makes disparaging remarks concerning those of another race can consider himself a true disciple of Christ. Nor can he consider himself to be in harmony with the teachings of the Church of Christ. Let us all recognize that each of us is a son or daughter of our Father in Heaven, who loves all of his children” (President Gordon B. Hinckley, “The Need For Greater Kindness”). “Thus saith the Lord: ye shall not esteem one flesh above another, or one man shall not think himself above another” (Mosiah 23:7). “A commandment I give unto you, which is the word of God, that ye revile no more against them because of the darkness of their skins” (Jacob 3:9). “Racial prejudice is of the devil. Racial prejudice is of ignorance. There is no place for it in the Gospel of Jesus Christ” (The Teachings of Spencer W. Kimball, p. 237).